Barr & Stroud describe their range of Sierra binoculars as "a blend of superb optical quality and rugged refinement that has produced an elegant range of binoculars that take the Barr & Stroud brand to new level of performance and sophistication." With this bold statement I really looked forward to testing the 8x32 version that they kindly sent me to review. In general mid-size binoculars with objective lens diameters of around 32mm like the Barr & Stroud Sierra 8x32 are really versatile. They are ideal if you want a bit more light gathering performance than true compacts can offer, but still want a light, fairly small binocular that is ideal for traveling with and easier to carry in the field than full size versions. The dimensions (128x121x47mm /5.0x4.8x1.9in) of the Barr and Stroud 8x32 Sierra binocular compares pretty well with most other mid-size roof prism binoculars that I have reviewed. Their weight of 21.0oz (596g) is fairly lightweight: For comparison one of my favorite 32mm binoculars, the Nikon 8x32 EDG Binoculars weigh 23.1ozs (655g) and the top of the range Swarovski 10x32 EL Binoculars weigh 21.5ozs (610g). It dampens down any noise from bumping them that could frighten away skittish birds and other wildlife as I often do with my wedding ring. These Barr & Stroud Sierra's are O-ring Sealed and therefore fully waterproof and have been immersion tested at a depth of 1.5 meters for three minutes. They have also been "nitrogen purged", which means that the air inside the binocular has been replaced with nitrogen gas, this prevents the interior optical surfaces from fogging up due to rapid temperature changes or in areas that have high humidity. As with all the Barr & Stroud binoculars that I have reviewed, they have twist-up eyecups. These are also better quality than most as they are made of metal with a rubber coating for comfort. They have 3 click stops - flush against the eyepiece, half-way out or fully extended. Non-eyeglass wearers will just use the eyecups in the fully extended position. There is an excellent 17.8mm of eye relief, which puts them in the category of long eye relief binoculars and are therefore ideal for anyone who wears glasses. Focusing is achieved using the central wheel on the binocular that takes 2 full turns to go from near focus which is an excellent 2m (6.6ft) to infinity. I generally prefer it to take less turning of the wheel to achieve this, but the less aggressive focusing mechanism does have the advantage of making fine tuning your focusing more accurate. On the binoculars that I tested, the mechanism was smooth and achieving a sharp focus was really simple although the was a very slight "squeak" sound as the wheel rubbed against the rubber armour. This could easily be fixed with a little lubricant. The diopter adjustment is located on the right barrel of the binocular. It allows you to adjust the lenses separately to allow for differences in each of your eyes and plays an important part in correctly focusing your binoculars. The ring on the 8x32 Sierra that I tested was just tight enough so as not to be easily accidentally moved, but not so tight that makes it hard to adjust. I thought that the image produced by the Barr & Stroud Sierra 8x32 was really good. You can notice the difference in brightness when comparing them to a compact binocular. As well as bright I thought the image was sharp and I could not see any colour fringing and there was only the slightest hint of softening of the image on the periphery of the view. The 8x32 Sierra comes equipped with quality BaK-4 roof prisms which means that they are made of superior optical glass that will help in ensuring you get a high-contrast and sharp picture over the full field of view. These binoculars also have a set of phase correction coatings on the prism glass, an expensive process that keeps light in correct color phases, yielding brighter images and higher edge-to-edge sharpness. According to the manufacturers the "high-tech phase coatings alone increase prism reflectivity by 8% and it give you on average an extra hour of visibility at dawn and dusk compared to standard binoculars." The optics are also fully multi-coated, so all air to glass surfaces have received multiple layers of antireflection coatings which again will ensure that more light gets to your eyes by reducing the light loss and glare due to reflection for a brighter, higher-contrast image. The Sierra 8x32 comes supplied with reasonable quality soft carrying case, straps and lens cleaning cloth. It is a pity that the straps are not more padded, like the ones that you find on more expensive optics, but they will do the job (see video below). The lens caps fit well onto the binoculars and should not fall off accidentally. I especially like the tethered objective lens caps, that make misplacing them much harder and don't get in the way when using your optics. If you don't like them attached to your binocular, they can also be removed (see video below). 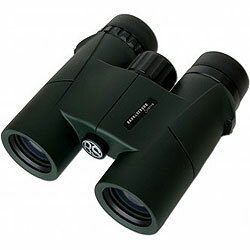 The biggest compromise in choosing a compact binocular over one that has larger objective lenses is the brightness of the image produced and whilst the difference is not huge, it is more noticeable in poor light conditions where you can notice it if you compare a compact and full size binocular side by side. 8x32 binoculars like these Barr & Stroud's have an Exit Pupil of 4mm and a Twilight Factor of 16, both of which point to the fact that they will hold their own in poor light conditions and whilst there in no denying that an 8x42 in theory will perform better, these have the advantage of being more compact. It is important to remember that whilst these figures do not take into account the quality of the prisms, lenses and their coatings, they do make it possible to compare the performance of different configurations of binoculars in low light conditions. Features like their phase coated Bak-4 prisms and fully multi-coated lenses will mean that they outperform cheaper optics of the same configuration and probably beat cheap binoculars, with lower quality prisms and lens coatings with 42mm objective lenses. 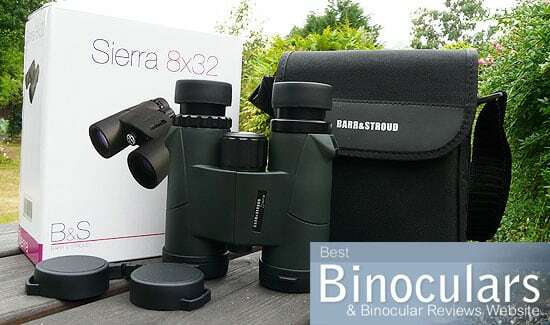 The apparent field of view for the Barr & Stroud Sierra 8x32 is a good 129m at 1000m but does fall a little short of the very best like the Nikon 8x32 EDG Binoculars (136m at 1000m) and the Swarovski EL 8x32 (140m at 1000m). The close focusing distance is an excellent 2m (6.6ft) beating even the most expensive mid-size binoculars on the market. Considering that these Barr & Stroud 8x32 binoculars can be bought for around £100, I would say that make excellent value for money. I would highly recommend them to anyone looking for a mid to entry level mid-size binocular that far outperforms their price tag. They will make great traveling companions, good for camping if space is a factor and therefore also make ideal safari binoculars. The 8x magnification, with a fairly wide field of view is ideally suited to those that enjoy birdwatching as well a looking a the larger stuff. Highlights include the close minimum focusing distance and the use of quality phase coated Bak-4 prisms.